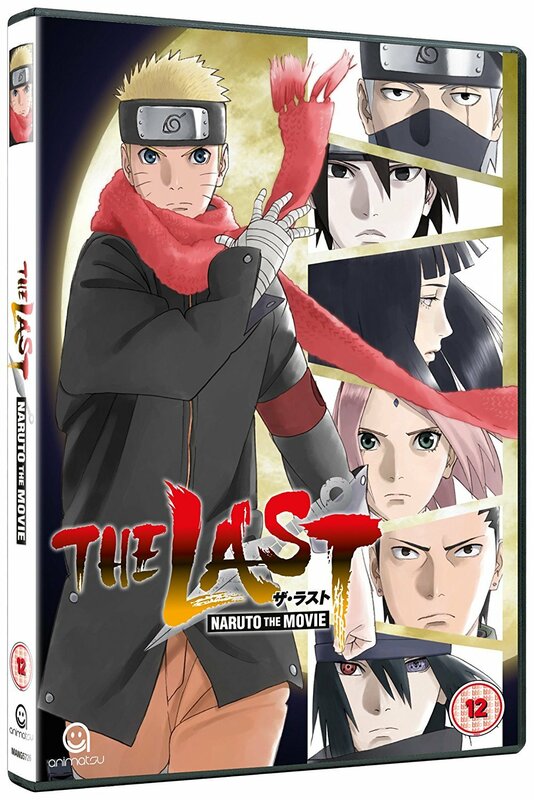 The Last – Naruto the Movie, is the tenth overall film based on the Naruto franchise, and is NOT the last one, though the last to feature Naruto as the lead character. For the previous film I mentioned how it was odd that it was made to fit into the anime’s timeline, well this movie fits into the original manga’s timeline and is in fact canon to it! This is where, funnily enough, if you’ve just been watching the anime via the DVD releases or even simucast straight from Japan, you’ll get a good bunch of spoilers as to how the series ends and the fates of the lead characters. When the manga ended it time-skipped several years for its final chapter and did the classic “here are the characters as adults with kids of their own!” thing, but missing was how Naruto, the eternally dense protagonist, and Hinata, the shy always-had-a-crush-on-Naruto character, got together to have to children. That’s where this story comes in, set two years after the end of the Fourth Shinobi World War, Hinata is still trying to get Naruto’s attention, but is finding it hard both due to his lack of attention/knowledge of what love is, and that fact that after becoming the hero of the hour during the war, he now gets all the attention from all the girls of the village. Meanwhile, Kakashi (who is now Hokage) and the other village leaders have a meeting about the rather disturbing news that the moon has suddenly began descending down towards the Earth. On a hunch he sends Naruto, Sakura, Shikimaru, Sai and Hinata after people who have kidnapped the latter’s little sister, thinking that the two incidents aren’t a coincidence. This leads me to talk about the weakest part of the film, the lead villain. Now, it’s always a problem with any film that when you introduce a new antagonist as he/she has to be introduced, developed, and then satisfactorily ended, all in under two hours. I think when it comes to these shonen spin-off (or not so spin-off in this case, but you know what I mean!) movies that we all know the lead villain is often there just to get defeated by the lead antagonist in a large-scale battle at the climax, and that’s exactly what they do here. They try and make you care about him, as per usual with Naruto villains there is a tragic backstory to him, but in the end you don’t really care. 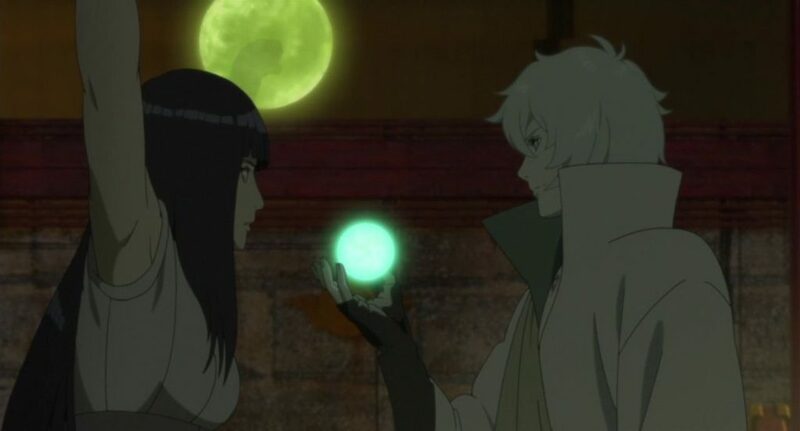 Thankfully, this time that’s because the whole purpose of the film is how Naruto and Hinata fall in love with each other, and I can say that it is handled perfectly here. Naruto’s realisation of how devoted Hinata has been to him, and then realising he actually loves her back but being too shy/ashamed to say it back for a while, is really well done. Surprisingly so. 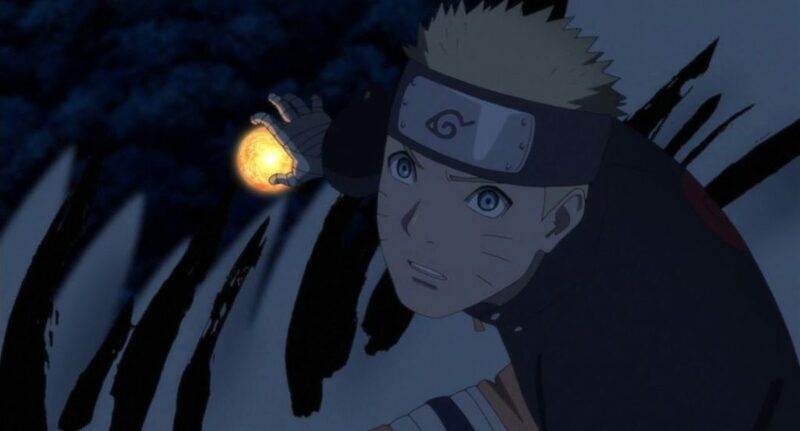 Naruto is a lead protagonist I’ve never had too much attachment too, instead it’s the other characters and the world that was created around them that drew me to the show, but by the end of the film I felt genuinely happy for his discovery and maturation and I think I actually liked him a whole lot by the time the end credits arrived. After all this time, it was a “good for him, he deserves it” moment. So should you buy it? Yes. Yes you should. Well, unless you have literally no interest in Naruto, but then if that’s the case you probably didn’t bother reading this review. If you’ve managed to remain spoiler-free while watching the anime, then have fun with the now needless filler going on and you can watch it when the anime finally ends the manga storyline (before moving on to a new show about Naruto’s son…) because it does fill in a little hole in the overall storyline. It should also be praised on its own merits, a shonen film that’s not a brief set up for a final battle but instead a love story that’s handled really well for a show that has been anything but throughout its run, minus a few juvenile crushes here and there. Overall, while it has some good fight scenes, this is all about how two characters got together in the period between Naruto’s 699th and 700th chapters, and it does this very well indeed. A must have for even the most causal Naruto fans.